Okay, okay, I have been a terribly lax blogger these last weeks, it’s true. Living in Antwerp has me on total input overload, which has somehow disrupted the output circuits. All is well, never fear, we are having a marvelous time, Conal is enjoying his work and exploring the city with me, and we are even making some friends in the neighborhood. I’m over my cold, which I obtained internationally when I traveled to Zurich to record with Michael Stillwater. Jet-set germs, apparently. With the help of the powerful antihistamines available over-the-counter here, as well as some cough syrup with codeine to help me rest at night, I’ve pretty much kicked the beggers out. I think this is the fastest I’ve gotten rid of a serious bout of bronchitis for years. Usually, the thing will drag on for a month. I am ever so delighted to be clear headed again. 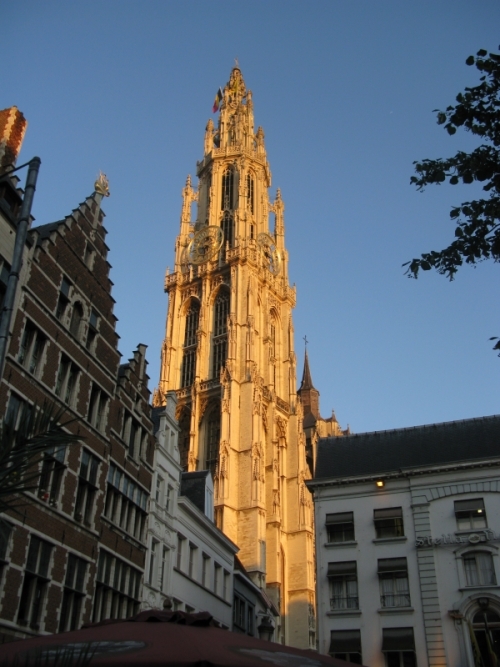 Within the compact central portion of Antwerp, there are a gazillion restaurants, shops, malls, cafes, cathedrals, museums, lovely squares, statues, fountains, and endless historical architectural masterpieces. We are living quite a contrast to our San Andreas lifestyle, let me tell ya. People here, who can hop a train and be in freaking Paris in two hours, are impressed with the idea of having to drive a half an hour just to visit a sizable grocery store, or an hour to reach a city of any size. When I tell them that a drive from my hometown of Seattle to my new home in California takes about 18 hours, they knit their brows and think about that, then I remind them that San Andreas is only halfway through California on the way to Mexico, and they give up. Belgians can drive from one end of their country to another in a couple of hours. I sympathize with the shock, as I have it in reverse. However, Antwerp is so ridiculously charming I don’t know why anyone would ever want to leave. Oh, all right, I know why. There is ridiculously charming stuff everywhere in Europe. If you live in one ridiculously charming place, then of course you’d like to visit other ridiculously charming places, just for a break. The spire of the Cathedral of Our Lady, lit up in the sunset. 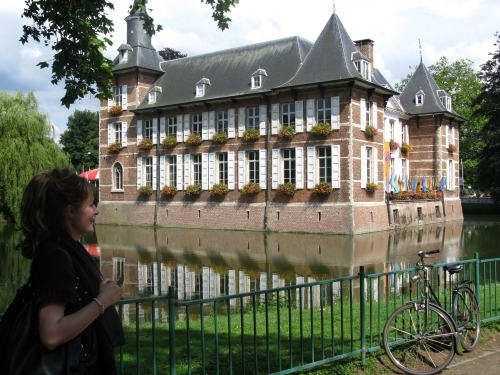 The lovely Ester with a house with a moat in Schoten, a town just outside of Antwerp. More on that story later.